ME - Myalgic Encephalomyelitis - not just fatigue. Views expressed are not to be taken as medical advice. 10 Things ME patients need NOW! I have copied below what I wrote to the General Medical Council in support of Dr Myhill's complaint regarding the PACE trial authors. I have decided to make my complaint public, so that others might also be encouraged to write. My letter used the template provided by Dr Myhill - it's downloadable from the link above. I just deleted out the sections highlighted in red, and replaced those sections with my own personal story. I tried to emphasise how the PACE Trial outcomes affected my treatment. Dr Myhill says you do not need to be living in the UK to join this campaign, so where-ever you live, if you feel that the PACE Trial has affected how you have been treated, you can still write. There is also a petition that allows everyone, whether personally affected by the PACE Trial or not, to show their support. At time of writing there are over 5000 signatures on the petition, but it would be fantastic if many more were collected. Please share this petition widely and encourage others to sign. Change.org: I am showing my support for Dr Myhill's complaint to the GMC about the PACE authors. 1. I have suffered damage because GET (Graded Exercise Therapy) has been widely promoted as therapy for ME. When I was first ill in March 2012, I attended my local GP surgery to seek advice and to obtain the required medical notes for my workplace. The GP advised me that “3 short brisk walks a day” would help me to recover, and that over time my body would gain strength allowing me to do more. Naturally I took this advice and started walking. Prior to illness I was a very active, person who loved to walk. We live on a small-holding and I used to walk my dogs every morning before work. I also had a busy teaching job where I was on my feet most of the day. So, I was shocked when I found that these prescribed short walks were causing me to get out of breath, and to feel light-headed and dizzy. As the days went by, I found I was able to walk shorter and shorter distances before I ended up in a heap on the ground trying to make the world stay still. Something was very wrong. In addition, I had increasing difficulty with my coordination, my balance, and my speech. I felt as though I was drunk (no alcohol involved obviously) and that I had to concentrate very hard just to walk to the bathroom without crashing into the walls. I developed a speech stoppage where the words in my head just wouldn’t formulate on my tongue. I was going rapidly down-hill and my body often felt on fire – as though it was constantly fighting flu. My muscles ached, and I felt physically miserable. Yet all the advice from the GP (a locum, so I don’t even remember her name) was still that exercise would help me. I blame the PACE trial, and the CG53 NICE guideline for this damaging advice from the GP. The PACE Trial results were given huge media prominence, and “exercise” was being widely touted as a cure for ME in the papers, in magazines and online, in the years around the time I fell ill. Indeed, these articles, uncorrected by the authors of the PACE trial, tended to portray ME patients as individuals with a simple lifestyle burn-out who just needed some basic lifestyle advice in order to recover. The guidance from NICE suggests that exercise in the 50- 70% range of max heart rate is helpful. I know for a normal healthy person, that exertion at this level this equates to “a brisk walk or gentle jog”. I wonder if that is the reason I was told to walk “briskly”? The doctor did not suggest I use a heart-rate monitor, so she couldn’t have known that in fact this advice was taking my HR into the 90% + range of maximum effort. So although I did not receive formal GET, I consider that the advice I was given was based on the premise behind GET, and that the PACE trial conclusions influenced my GP towards promoting exercise. I also consider that such advice was wholly in appropriate and considerably damaging. My long-term health declined substantially because of the advice I was given. Indeed, it was more than 4 years later before my health returned to the point at which I was first given that advice to take brisk walks. Please note: My subsequent improvement was a result of private treatment. I took an off label anti-retroviral drug for a year. Without this, I believe the exercise advice I received early in my illness would have left my health permanently damaged. I should note here that I did not continue to harm myself in the face of such an obvious decline. I spoke to other patients online, who explained how harmful exercise can be, and as a result I tried to rest more and to reduce all exertions to a level below that which caused me harm. After stopping my prescribed walks, the rate at which I was declining slowed dramatically. I therefore believe that the PACE Trial, with its highly controversial confirmation of GET as a useful therapy, has harmed me. The PACE Trial was published just a year before I became ill. The fact that these results were so widely disseminated and loudly hailed as a ground breaking, meant that the GP I saw was totally confident when she advised me to exercise. I believe that the GP I saw had no idea that the exercise she prescribed me could in any way harm my long-term health. 2. I have been turned down for benefits because the physical nature of my disease was not properly recognised. • I was denied early retirement because my sudden onset ME was not regarded as a long-term condition, therefore it was judged that I was likely to recover before retirement age. Ironically if I had had a long history of sickness leave, I would have been more likely to be awarded early retirement. As it was, with a sudden onset, and with only the duration of illness that I could demonstrate at the time I applied, meant that my application was denied. The severe level of my disability did not seem to be taken into consideration. The promotion of the PACE therapies as a route to “recovery” meant that ME was regarded as easily treatable and not long-standing. I believe that the PACE trial therefore affected how my application was handled. Now 6 years since onset, I am still unable to work and remain in the Support Group for ESA. There is no facility to have that decision (to deny early retirement) reviewed despite the fact their assumption - that I would recover - has now proven erroneous. • My workplace colleagues were unsympathetic. One told me my illness was controversial, and another berated me on the phone for my lack of determination to recover. I received none of the usual niceties on leaving the workplace due to ill-health. No card, no flowers, no acknowledgement of the 16 years I had worked for the college. I put this entirely down to the publicity generated after the publication of the PACE Trial papers. Many of the media stories (uncorrected by PACE authors) suggested that patients were malingering and just needed to exercise and “think positively” to get well again. " I hope by sharing these details, I will give others confidence to also share their stories. The influence of those promoting a psycho-social approach has been far-reaching and incredibly damaging to people with ME, not only because of the dubious conclusions reached, but also because the psycho-social approach has received so much research funding. When so much of the available funding goes into researching endless permutations of the psycho-social approach, very little funding gets left to research the real biomedical, and physiological problems underpinning ME. That needs to change. It is time the truth came out. The PACE Trial has harmed me. 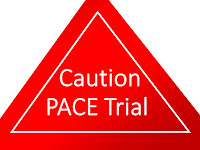 The PACE Trial has harmed countless ME patients world over. The PACE Trial authors need to be held to account NOW. If you have been affected please write your own letter to the GMC. Then encourage everyone you know to sign, Dr Myhill's supporting petition. Your MP might also be interested to know that the Yellow Card system for reporting medical harms does not extend to psycho-social therapies. Change.org: Stop harming ME/CFS patients - take CBT/GET out of NICE guidelines NOW. Excellent letter Sally. Very calm, clear and reasoned. Your story is not the same as mine but nevertheless has given me a few ideas on how to structure my own letter. Thank you. It is not always easy to write these things, and picking up the "pen" (ok keyboard LOL) to start took me a few weeks. So it seemed a good idea to share this to help others think how they might tell their stories. Thank you Karen. I hope so too. It's time things changed for ME folk. Excellent letter. Well done. Can't have been easy. Chronic Illness & "determination to recover"
New book by the creator of Pajama Daze! Change of doctors...will it help?